Our fairy butterfly ready to grant wishes last night going to the Halloween movie event. We have a Halloween school party tomorrow - I'm not sure if she is wearing the same general outfit or if she wants to change it up... she gets home in an hour or so, will talk to her about it. She was in quite the surly mood last night and an 'interesting' mood this morning... we'll see. And now, the seed geekery. Beans and corn. If you've had enough of this in past years - turn your eyes away now, or just glance at the pictures for the eye candy effect, and run away from the type ;) I won't subject you to all the measurements and notebook scrawls - but they happened, this morning, while Esme was at school and I was finally feeling in the right frame of brain to 'obsess' in a constructive way. Not counting what I documented in August - this is the corn crop for the entire year. It's not much, volume wise.. yes? But the genetics are what I'm after, and the eventual hardiness for our soil and climate. I also would like to choose for the easiest shelling type that has dried under our 'natural' conditions well. Eventually, it will be excellent for animal feed, although I ended up with mainly popcorn types coming through in the end. The dried beans from the year, not counting the small white ones - don't know what they are! They were climbing another tree by the other fence where I had only planted Good Mother Stallards, and are obviously not those! Blue Black Shackamaxon : planted in Location A and B, in location A it was easy to see that they all came out exactly as expected. Ate a lot of these as string beans with the Providers. Tennessee Greasy beans : white beans with black spots that were planted in Location B, climbed eight foot tree opposite of the beans mentioned above. Some came out like the Hopi with c-shaped streaks (these may be Rattlesnake beans actually...I 'lost them' in the same location), some came out black like shackamaxon mixed with them in same location, a few variants between. So really, this one is a tossup again like last year.. I should just be tracking what I planted instead of trying to give it a name! Where did they come from - what are they? Are they just oddball genetics in the original set? The ones on the left were grown last year as 'Tennessee Greasy Beans' but had come out white with black spots and streaks. Now after being stored in glass for the year dry.. they are orange with black spots. The Bosnian, on the right, which I expected to turn orange with age, are nowhere near that color. Mark didn't want me to plant them this next year - there were SO many of them, and there were ants on them when he went to pick them at the end.. but so productive, how can I not plant them? I ate several bowls worth this summer and there was just always some there if it was needed, or dried to seed if I didn't get to them. As a 'survival' food, this one really takes the cake as a no-brainer to plant. She had a sleepover night with Grandma this past weekend - that was the most exciting thing that has happened for her in a bit. They did great - she didn't run Grandma into the ground and she slept well and didn't worry being away from her bed. I worried.. and had bad dreams, like usual... but she was so happy the next morning and proud :) We were tired geeky parents - just played Minecraft and Mark was nursing a sore tooth still. He had an extraction done on a cracked tooth which was not fun for him and he is still recovering from it nearly a week later. I have done very little sewing this month - a pair of pants in school colors and a single juggling ball beanbag (of which I promised myself to do three by her birthday). I have knit quite a bit on a project that I take to work and back with me. We are not enjoying the cold mornings out to the schoolbus and back - it is dark and getting Esme up and moving at 5:30 am to get on the bus an hour later is still a challenging task daily. She is doing much better at it than when I was getting her up at 6 am... she dawdles some, but she dresses, eats and does a homework sheet or two before she goes. It gets her brain started - and her behavior at school is much better if she is 'in gear' before she goes. Vacation will be nice. We have the new version of Minecraft and I do have projects to do. Nine days of just being Mom and not Plumbing Guru/Super Saleswoman milking blood from turnips while keeping my ethics etc... We are going to a movie tonight that is a free Halloween event. That will be a crazy run home from work and pick her up and go... then a few days off and her party at school, then vacation. This is the pumpkin we bought at the flea market yesterday. We have all this week off from school and I close at the store - so I told her we would have to wait until today to do the cutting. 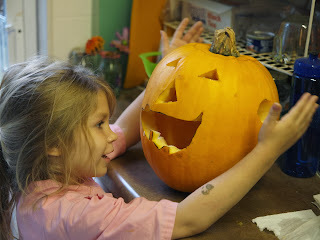 She came up first thing this morning and said she would like to make the jack o lantern... so I crawled out of bed. I had her draw the plan out in her notebook and she decided on the one in the top right corner for the face. Then she made a few attempts to draw it. We talked about all the things and wrote out the words so she could see them on paper. A happy pumpkin for Halloween! Now she is drawing EXIT and ENTER signs on her spaceship with chalk and trying to get me to come to a party... It is a rainy rainy morning outside and she is too full of energy and ideas! Esme has a cold. She has all week off from school. Mark is planning out how to build her a school bus shelter up at the hilltop garden to wait in during bad weather. I have to work all week at the store. I'm debating making the blanket I've been knitting (which is not very wide) into a washable rug for Esme's bedroom floor... I could always do that with my patchwork, too. I have a nice heavy upholstery type fabric that could be used for the backing. The new pink and brown mittens.. they fit, but are not very tight in the wrist. I put the card with her hand tracing in her baby book with the date on it.. it shows her hand size against my hand size, which is worth keeping for the future. She asked for me to take this picture, too - without the mittens. Playing with the telling time book and a clock we made from a coffee can lid. She saw a clock at the library today in the toys section and was interested in it again. We asked for a child's library card today. She has been reading fairly well and we have read four books a week from the library the past few weeks. I had asked her a few times before and she wasn't ready - but today, we did it. We also met up with a friend at the park today for a little while, fed ducks, ran around with feathers and then had to go home in a rainstorm. We stopped for ice cream treats on the way home and she had a big red spot on her nose from the star bar she ate that Daddy noticed when she got home. Little bit of quilt I made up last night - thinking about what to do next with it.. all of the pieces in it are scraps from clothing I made for Esme. If she settles down for a bit soon I'll get back to working on it. The 40-50 degree mornings have begun. I started a pair of mittens for Esme yesterday - no picture yet, and she has been agreeable about trying them on until I got the right amount of stitches in the cuff. I had overshot so much - started out with 44 and wound down to 30 stitches with a sport weight yarn on size 3 double pointed knitting needles. Now I've had her trace her hand out and am working up to the point where I will include the thumb. No picture until after that -- as I may have to rip it out again. I had been knitting the cuff with brown yarn and she said 'I don't like brown.' and then I showed her the pink for the striping after that - and she suddenly became very happy. It is a pale pink, and I just didn't see the mittens being all that color and surviving. Both yarns were in a scrap basket someone at work had passed down. I made a pair of pants yesterday out of a midweight 'almost' denim type cloth I found at the store. They will be a bit warmer than her standard cotton elastic waist pants. She was upset because she wanted them to be playclothes - and I told her they were for school. She wanted to keep her school clothes (the pink set from August 28th) so badly yesterday - she told me on the way down the road from the bus stop. I realized after a sentence or two she meant 'keep them on the rest of the day', and told her no... much sadness. She started asking me spelling questions yesterday instead of math questions. She has been getting multiple number/math sheets in her bag instead of just one per day - again, I read too much, but maybe her teacher has seen that is a way to keep her occupied in a good way. Her behavior had been much better, as well. She said she got all the stickers yesterday and no time out.. Friday was no time out. This morning I had to convince her she did need to go to school, even if a kid bullies her, even if it is not fun... we've signed up for this and it will be a while before we could go to homeschooling -- and that is a lot of work on her and us that HAS to be done if we do it, and she wouldn't get to see the bad kids or the good kids very often, just like before - if we did. She thought about it for a while.. did get ready and was in half a good spirit when she left this morning. I gave her the pink coat I found at the thrift store and that did make her happy, it was almost perfectly new. This kid that has been bullying her has taken away little things she finds like strings and sticks, pushed her, told her that her clothes look like pajamas... Mark thinks because the school is focusing on anti-bullying so hard Esme takes the bullying even harder than she would otherwise. There is also a slight chance that the boy 'likes' her in the way five and six year old boys do...and is bugging her because of his uncomfortableness with liking a girl. We put the apple seeds from tonight's dinner in a pot in the window today. We will see how many days/if we get anything coming up from it. Cardboard stove made from three boxes in our recycling pile in the garage. Esme's sixth birthday is coming up, and I was thinking about toys or gifts.. and thought, hey - that doesn't need to be bought, or a birthday present.. we can whip one of those up tonight, boxes willing. A little paper, tape, a spool that is on the inside with the dial attached to it, and voila, one child sized cardboard stove. The door handle I am a little proud of - it is from an airbed box that is the back part of the stove. It was too perfect not to make use for something I was wondering how I would do! Esme said no painting- because it takes so long to dry. She wanted to play with it right away - no more of the waiting. Then she made pretend tea and threw hot dogs in the oven. *heh*. I wrote her name and the year on top of it we will see how long it lasts as a toy. Her Magic Theater Box from when we moved her to her room is over a year old and still in use, played with every couple of days. It is getting in rough shape - but I had been able to paint that one with semi-gloss so it has lived through a lot of humidity and rough play. We talked about finding a box the right size to make a cradle for her baby doll, with a pillow and the blanket I had made for it. This is the first time she has really played with a baby doll for years - I think it is because she met a little girl at school who likes dolls. It is really sweet though, especially since we mostly skipped over this stage before. She named the doll Billy - and it is a boy or a girl as she wishes... we found a Duplo block piece in her collection that was perfect to use as a bottle and I took some scraps from my table to make a blanket for it. She has insisted on tucking it in and feeding it for about three days in a row, and has been receptive on how to pick it up 'properly' and to learn not to mistreat it because you would not do that to a real baby etc.. she said 'oh, that's right', and carried it properly, set it down nicely and then pretended it cried a little while later for food. She is also taking another try at learning the rules of checkers... played a decent game against me last night and I let her 'win' during the middle, so she did win at the end but I made it harder as the pieces dwindled so she had to really think. The Mitten by Jan Brett. Esme found this very funny, although I did the reading. I told her the house was a lot like the one I grew up in (my grandparents, actually), with snow outside and mittens and a fireplace (ours was a woodburning stove) and Finnish/Norwegian decorations. Alexander and the Wind Up Mouse by Leo Lionni. We read this one tonight and Esme enjoyed it - especially after Alexander went to visit the magic lizard and got his 'quest' for the purple pebble. She was a little sad he didn't get his dream, and was a little unhappy that he got a friend at the end - because she wants a friend, and it was mixed feelings. Red Fox and his Canoe by Nathaniel Blanchert. We are halfway to 2/3 through this and Esme is doing most of the reading on this one herself, thus the slowness. The words get a bit harder as you go... she is sounding out some quite well and asking me about a lot of others. Very fun - I remember this one from my own childhood. Snow Trouble by Melinda Melton Crow. Very low reading level - but a confidence builder as it was quick and she knew almost every word without guessing/sounding. This was from the school library. A Bug, a Bear and a Boy by David McPhail. Fairly low reading level - she can read almost every word but it has some length to it so she is ready to be done when she gets to the last page. This was from a library sale and she does like it quite a bit. Learning mechanical skills with an adjustable wrench. The mechanic brought the bush hog back from having custom work on it, and Esme helped Daddy put the A-frame back together as it needed some adjustment to be hitched onto the tractor. The original frame was half this heavy, and the blade set was no longer available so he had a local blacksmith custom craft a new set using the old ones. Other notes:// Made a pair of school pants, discussed making a walrus toy during this weekend. Her behavior has been better - I think the teacher is doing more math? I can hope? There was an 'extra-looking' sheet of how to split seven many ways in her folder that looked handmade and she was proud of - but told me the circles should have been apples and she was upset they were not looking like apples. Did a science 'experiment' where we counted leaves, measured them, and wrote down the numbers on a chart. She was surprised to see that what she called the smallest leaf was almost the same height in centimeters as the 'biggest' leaf.. but the biggest leaf was four centimeters wider. She looked hard at that. We also did a lot of housecleaning today while little one was at school and about five loads of laundry. Maybe the cold/flu/ick that had me the past two weeks is subsiding some. We bought food coloring today, new shiny bottles for her. Then I had her get the writing journal and a marker, and write down 'in code' the experiments she was going to do. We wrote a 'key' of the colors so she could write just letters (and reduce the stress of the writing) and make 'equations' to record the 'findings'. We talked about a 'hypothesis' but she didn't get that - maybe next time. She did guess once what she thought something would make, red and green would make black - but then she saw it was brown, so there was a moment of interest there. After we had gone through as many of the variations as she thought were important (I reminded her to check the equations and see which ones we had not done - she did well!) Mark had made a container of oil, and we tested what the color did in the oil. It made 'dots', she said. We put some water in the mix, and it made bubbles AND dots. Then we put some of the oil on top of a container of water, and dropped food coloring into it. It made dots - but the spoon pushed the food coloring deeper into the water, and it made a 'whoosh' and colored the water underneath. After we cleaned up I had her come upstairs and 'explain her findings' to Daddy. We answered a few questions and made a sheet about it to send to her teacher. I am starting to work with Esme on subtraction, and carrying over larger addition numbers... began a little bit of length, measurement and halves vs. quarters. Her behavior in school is still getting her in trouble... not too many of the things serious, but most of them indicate boredom with what they are teaching. She has been going and listening at other doorways of classes instead of going back to class - and that gets her in trouble... and a few other things that just indicate she wants to find out where 'the action is.' Her handwriting and cutting skills are a bit better, but she finds them laborious at the best. We were practicing the sewing and cutting out a pattern tonight, again, and she showed some good perseverance. Someone had been telling her that she could do 'good enough'...when what she was doing was really only a half-effort on her handwriting. Trying to backtrack to get rid of that idea. She really thought there was no school this month because I had not written it on her calendar... we talked about school being a place to see kids, but it doesn't mean the kids will be friends, and learning to make good decisions while she is at school is the big thing. I will continue the extension of math at home, because she doesn't get it at school, they have just barely started addition as a concept. I hope it will help her to feel she is learning something if she does this at home before and after school when I'm available?